Last week I was offered to review the full selection of the Quick Reads books for 2017. I've never got round to reading any Quick Reads books over the years but was intrigued because one of the 2017 titles is written by Jenny Colgan so I gladly accepted. One in six adults of working age in the UK find reading difficult and may never pick up a book. People's reasons for not reading are varied: some people say they find books intimidating, that they struggle to find the time or that books are difficult or boring. Quick Reads sets out to challenge these beliefs and to show that books and reading can be for everyone. Each year we commission big name authors to write short books that are specifically designed to be easy to read. They are the same as mainstream books in most respects but are simply shorter and easier to tackle for adults who are less confident in their reading skills. The books are then sold through major retailers and online booksellers, or loaned from libraries. Quick Reads is making real, lasting changes to people's lives. Since 2006,4.5 million books have been distributed through the initiative, 3 million library loans have been registered and through outreach work hundreds of thousands of new readers each year have been introduced to the joys and benefits of reading. 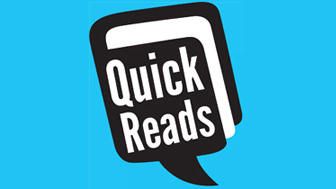 Quick Reads is a unique collaboration and we are very grateful for the support of everyone involved. • Dead Simple crime anthology (Orion) - a crime collection bringing together eight writers including Harry Bingham, Mark Billingham, Clare Mackintosh, James Oswald, CL Taylor, Angela Marsons, Jane Casey and Antonia Hodgson. • Looking for Captain Poldark by Rowan Coleman (Ebury) - a road trip novel about four people who meet online and drive to Cornwall to the Poldark set to find Aiden Turner. Coleman, who is dyslexic herself, is the bestselling novelist of The Memory Book and We Are All Made of Stars. • A Very Distant Shore by Jenny Colgan (Little Brown) - a romantic novel set on a remote Scottish island, where a Syrian refugee goes to work as a doctor. The small community welcome him but can he forget his past? Colgan is the bestselling author of The Little Beach Street Bakery. • The Other Side of You by Amanda Craig (Little Brown) - a re-imagining of Beauty and the Beast, set in London. Amanda has written a number of very well-reviewed novels including Hearts and Minds and A Vicious Circle. • Feel the Fear & Do It Anyway by Susan Jeffers (Ebury) - a specially adapted book drawing on the late Susan Jeffers' landmark self-help book Feel the Fear and Do it Anyway and its bestselling follow ups. • One False Move by Dreda Say Mitchell (Hodder) - a gritty novel set on the Devil's Estate in London, the same setting as her recent Flesh and Blood trilogy. Quick Reads are titles not necessarily aimed at me. I read quickly and I read a lot and these are titles designed to get those people who might struggle with reading to pick up a book and give reading a try. I love that as an idea because I obviously think reading is brilliant and that those who don't read at all are missing out. I found myself getting through all six titles within the space of the weekend. Three of the titles are crime based, two are contemporary and one is non fiction. I really enjoyed the Jenny Colgan title already being a huge fan of her work. 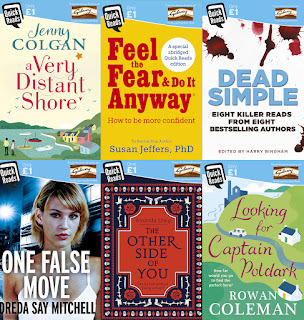 The crime novels weren't necessarily my thing but I enjoyed them enough and the experience of reading them all has left me interesting in hunting down Quick Reads titles from previous years. These books could be perfect for me when things are busy. I love to read but sometimes when things are busy at work I can put off picking up a new read because I know I'm not going to get a chance to read much during the week which means I can go a whole week without picking anything up. These books are ones I could finish in an evening and would stop me having those huge gaps in reading. Also I reckon they'd be a perfect way of lifting me out of a reading slump and keep me reading when I'm struggling to get into anything too weighty.